I got this lovely all pieced last week. It went together even better than expected and I managed to sew all the sashings together without any swear words…thanks to good music and Sugar Babies. I have the backing all ready and hopefully I’ll get this basted after I clean my kitchen floor. The pink is a slightly different shade than in the front fabric…but at 4.75 a yard I couldn’t resist (I think it’s sold out now). It’s very very pink. The front fabric is Ruby…available in October. Sew pretty,I love being able to "see" the fabrics. Another great quilt Allison!! 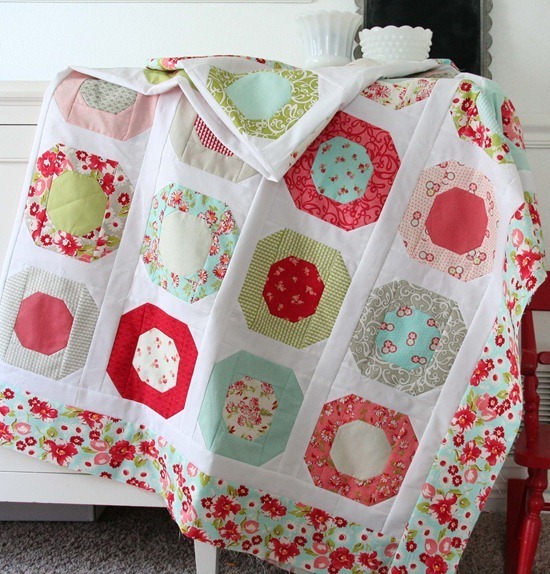 That is such a pretty quilt – I'll bet a lot of hard work went into it! OMG, that is seriously cute!!!! I absolutely LOVE it! Shouldn't surprise you since you already know I'm a HUGE fan. LOL Hope this will be a pattern soon. OH how pretty! And to think I have some of those very same fabrics that I have been trying to figure out what to do with!! Now if only I knew someone having a baby girl…. lotsa boys but no girls right now. Beautiful!!! i love Ruby already! I have great plans for those fabrics. Your creative mind has already created a great way to show them! this is great. i am even more excited to get my jelly roll of Ruby now!!! Lovely quilt…Macro dots…I like it! Oh I love the border! I haven't done a bold border like that yet, but now I'm inspired! so pretty!! I must make a quilt out of Ruby! This is beautiful and I really like how the backing works with the Ruby fabrics. Love this one! You amaze me with your creativity, talent and productivity!!! Looks fantastic! Pink is always good, the fabric for the back is really wonderful! Oh , SO lovely !! Love the fabric and the quilt pattern. Such a gorgeous quilt!! :o) I too love being able to see all of the fabrics. :o) I have a layer cake in Strawberry Fields and wonder if I could use it for this pattern. :o) Will you be selling it in your shop?? Very pretty. Lots of different fabrics that go so well together. Cheerful. gorgeous quilt and you're right that fabric is very pink – I got two lots at that price but am yet to use it – I'm sure I'll find something soon ! Beautiful. Will you be making this into a pattern/tutorial? Thanks for sharing. Oh, I love that pattern! Where could I get it? 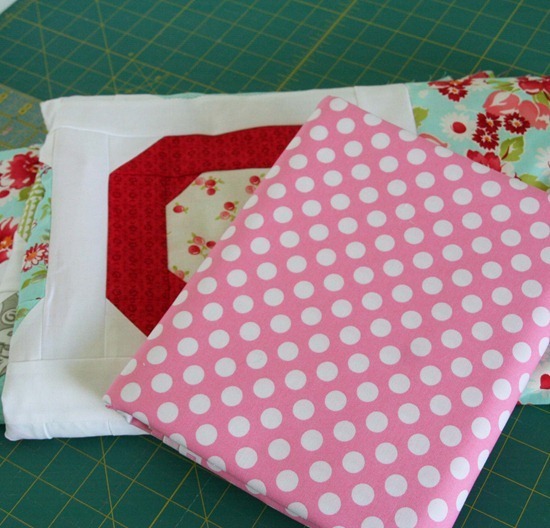 Have the perfect set of fat quarters in my stash! The pink dot fabric will look great on the back. So pretty! I'm generally not that big on pink, but this is fabulous! And it looks so sweet next to that red rocker! This is a beautiful project–the fabric and design are both great. I look forward to seeing more. I love this pattern ! A snowball with a snowball border. PLEASE do a pattern or instructions soon !!! Gorgeous!!!! I just love the Ruby line of fabric! Adorable! I love the fabric as well as the pattern. Thanks for sharing…..
this is a beautiful quilt! Do you honestly clean your kitchen floor before you sew? Sigh. I so need to take lessons from you :) Love love love that new fabric! And definitely cookies for the UPS man!